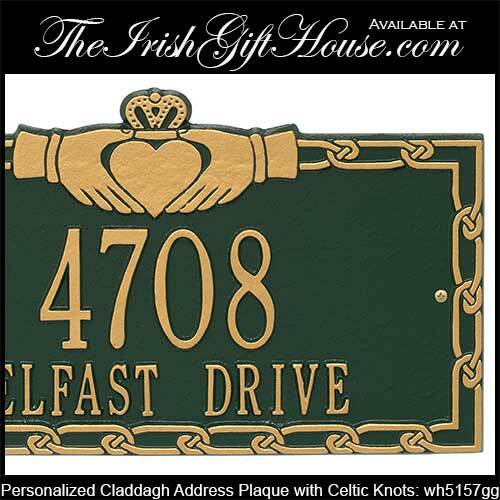 Personalized Irish gifts feature an abundance of Irish address plaques that feature the Claddagh along with the shamrock and Celtic designs. 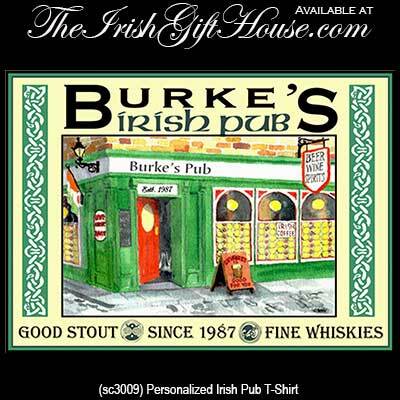 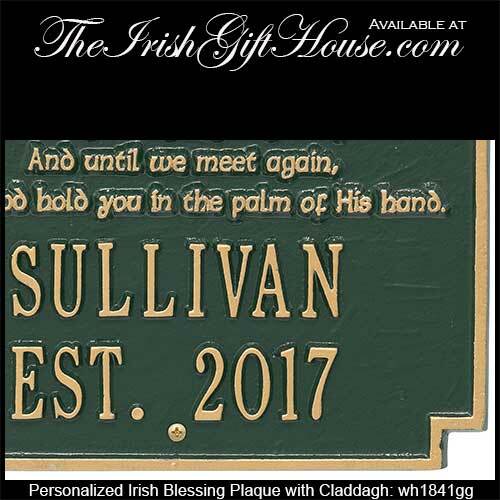 Personalized Irish gifts are ideal considerations for Father's Day and weddings along with house warming and anniversaries. 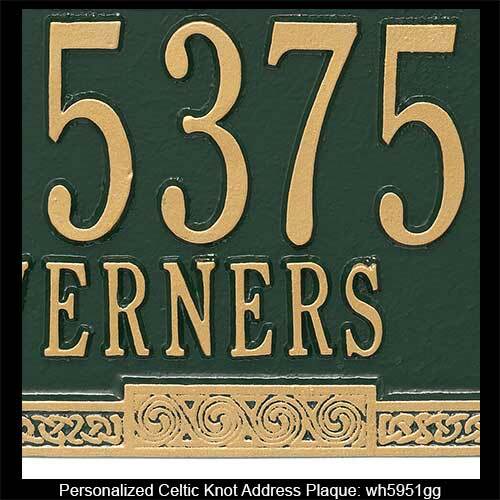 Each design allows for your personalized message that may include an address or any message that fits in the allowed space. 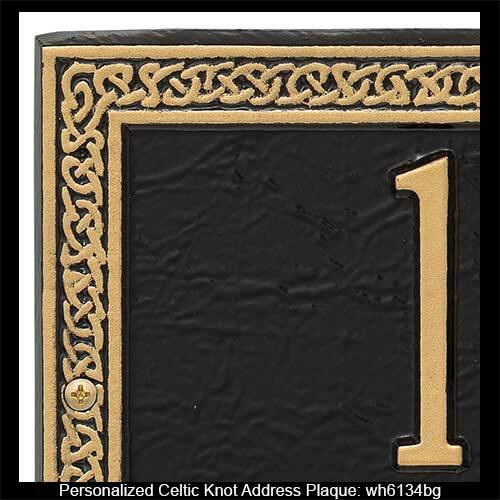 The Irish address plaques are available in multiple designs that are enhanced with features that include the Irish blessing along with Celtic dragons and knot-work. 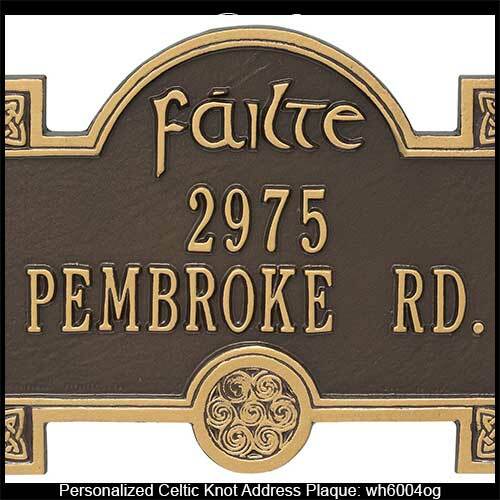 Additionally, some of these Celtic address plaques feature the Irish welcome of Fáilte or Céad Mile Fáilte and they are available in several different shapes and sizes along with many color combinations. 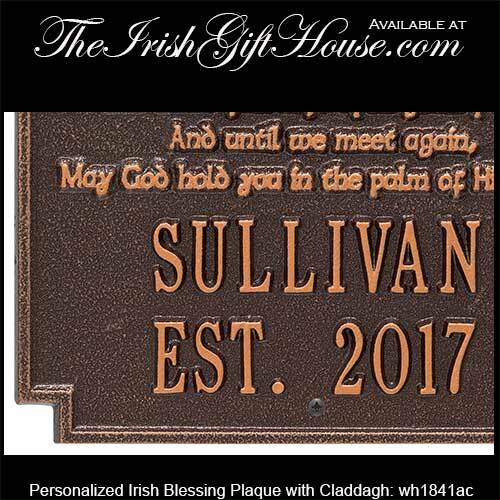 Please note that the personalized Irish gifts from The Irish Gift House, are special order gifts that require 14 to 21 days for delivery. 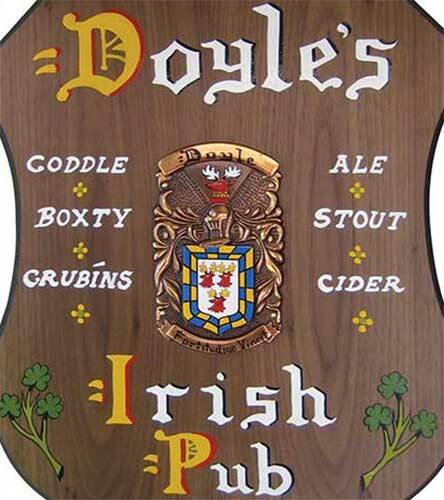 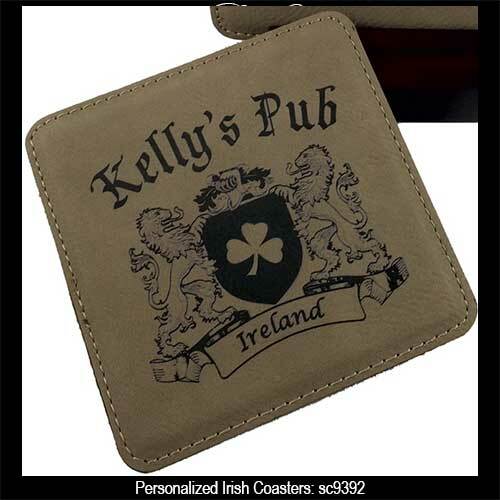 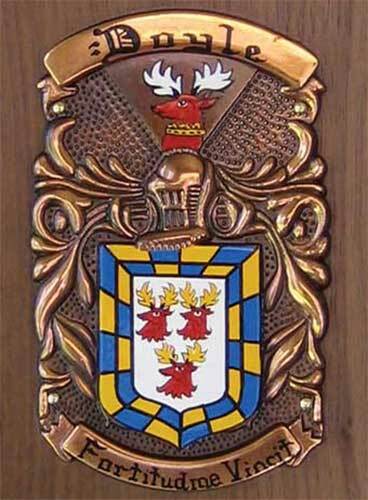 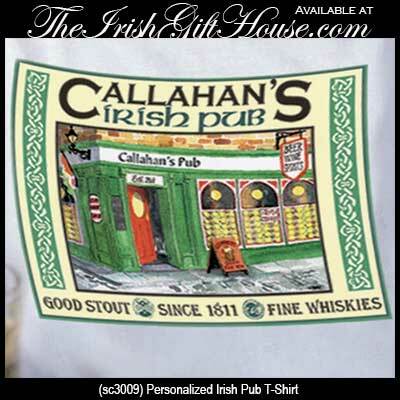 Irish coat of arms features a copper shield on a personalized wooden pub sign base. 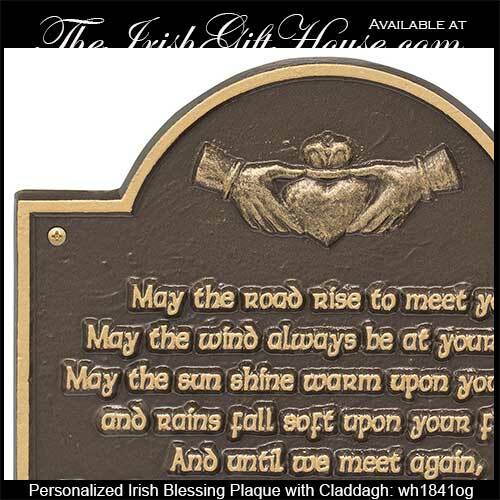 Personalized Irish plaque features the Claddagh along with an Irish blessing and it is further enhanced with your family name or message inscribed on the antique copper finish. 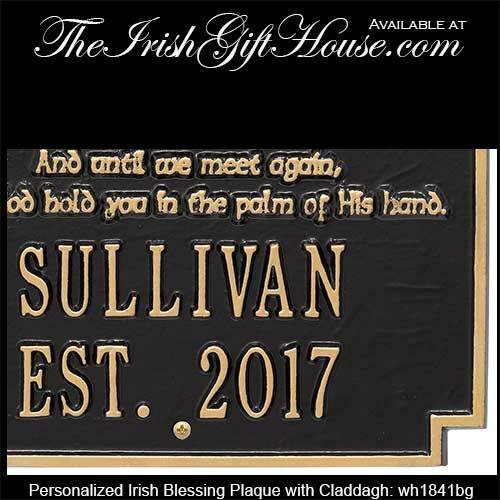 Personalized Irish plaque features the Claddagh along with an Irish blessing and it is further enhanced with your family name or message inscribed with gold lettering against a contrasting black finish. Personalized Irish plaque features the Claddagh along with an Irish blessing and it is further enhanced with your family name or message inscribed with gold lettering against a contrasting green finish. Personalized Irish plaque features the Claddagh along with an Irish blessing and it is further enhanced with your family name or message inscribed with gold lettering against a bronze finish. 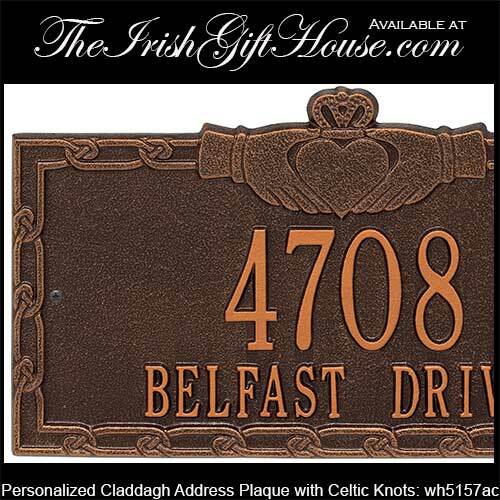 Personalized Irish address plaque features the Claddagh and it is further enhanced with two lines that may include your street address or message inscribed on the antique copper finish. 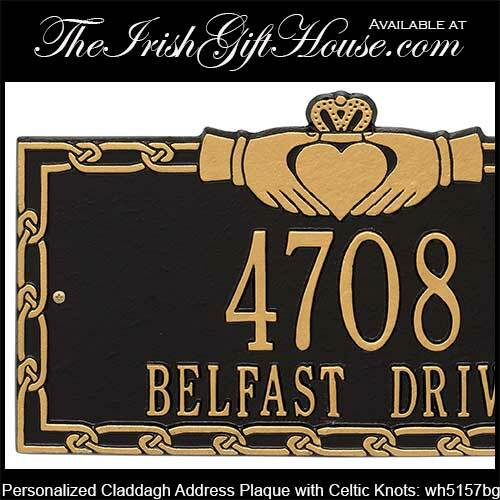 Irish address plaque features the Claddagh and it is further enhanced with two lines of personalized street address or message inscribed with gold lettering against a contrasting black finish. Irish address plaque features the Claddagh and it is further enhanced with two lines of personalized street address or message inscribed with gold lettering against a contrasting green finish. 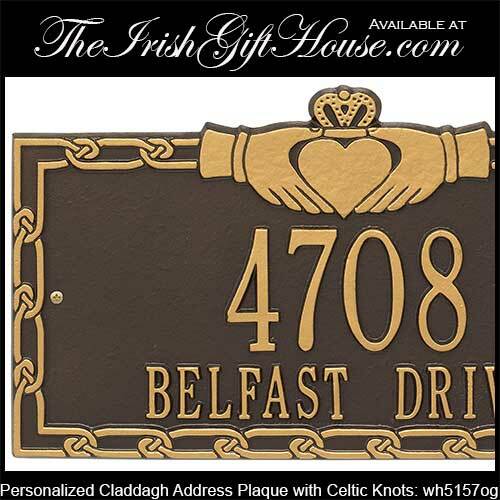 Personalized Irish address plaque features the Claddagh and it is further enhanced with two lines of your text that may included a street address or message inscribed with gold lettering against a contrasting bronze finish. 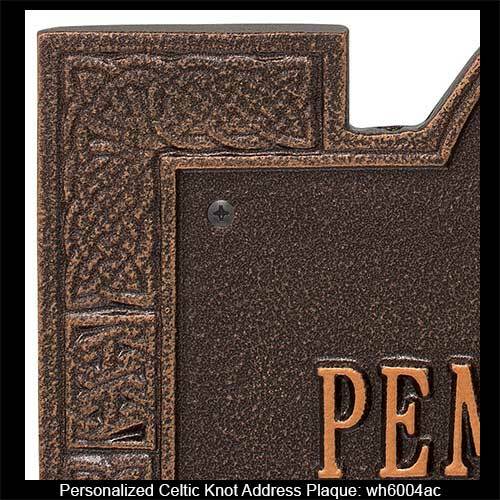 Celtic address plaque features a knot-work border and it is further enhanced with two lines of personalized street address or message inscribed on the antique copper finish. 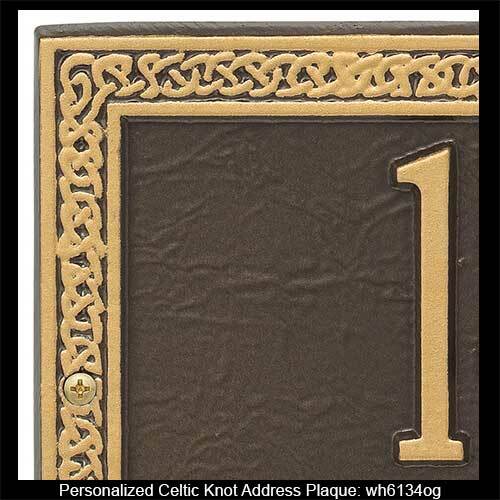 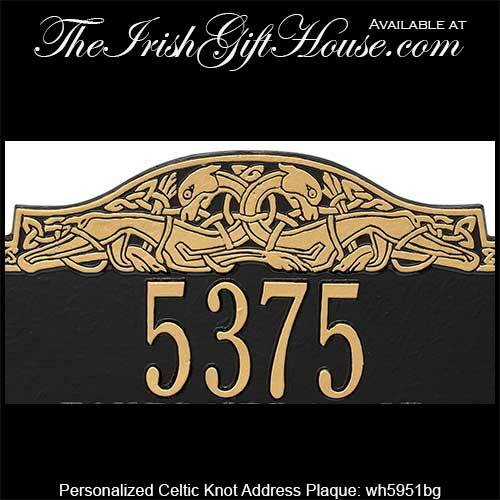 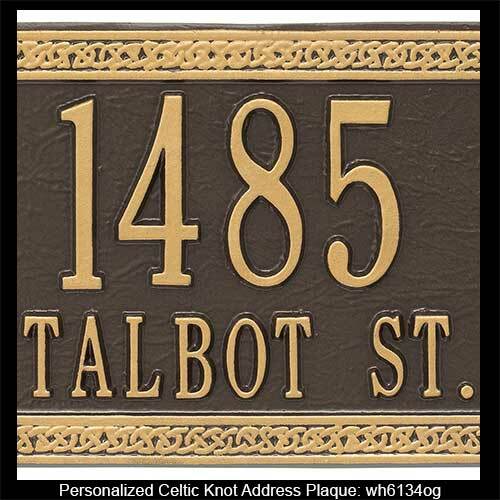 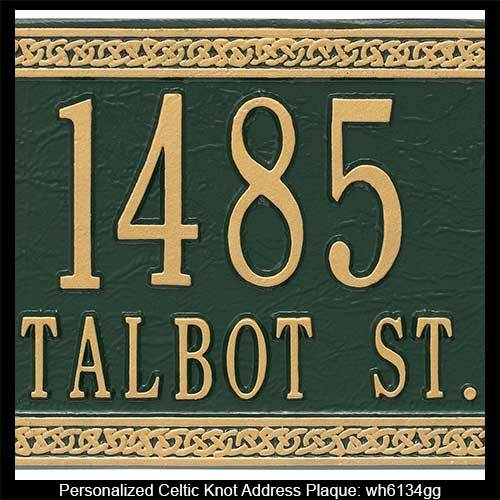 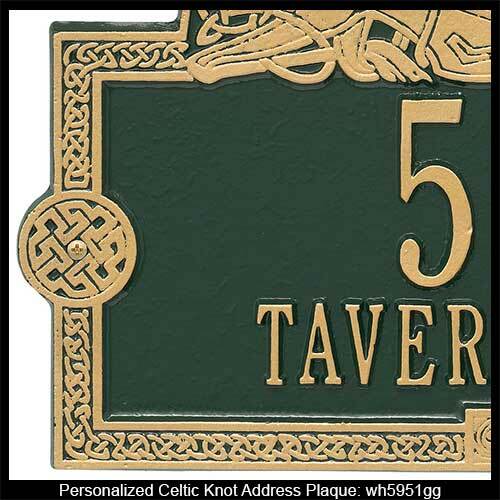 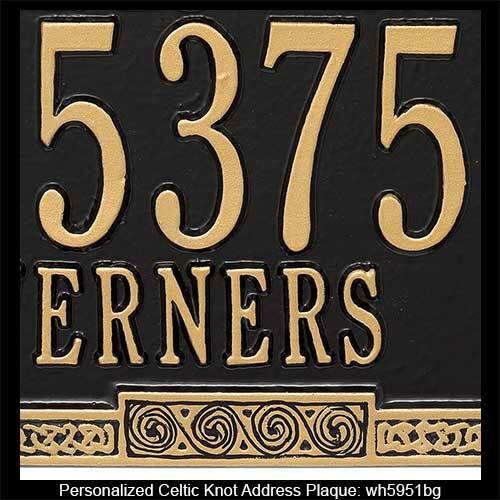 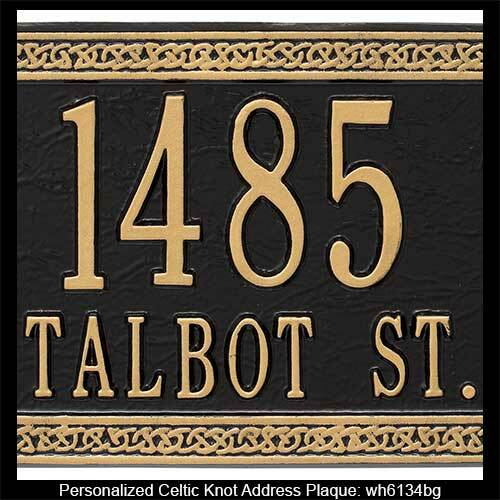 Celtic address plaque features a knot-work border and it is further enhanced with two lines of personalized street address or message inscribed with gold lettering against a contrasting black finish. 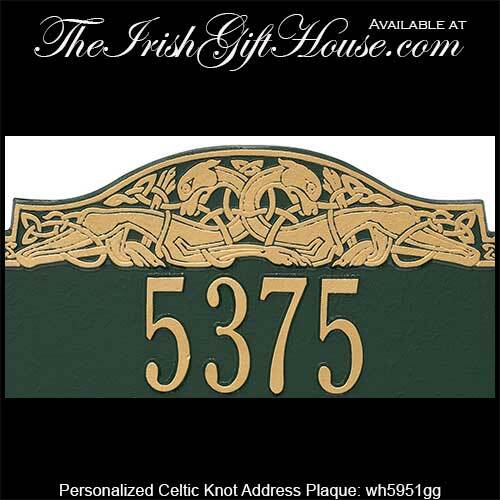 Personalized Celtic address plaque features a knot-work border and it is further enhanced with two lines of personalized street address or message inscribed with gold lettering against a contrasting green finish. 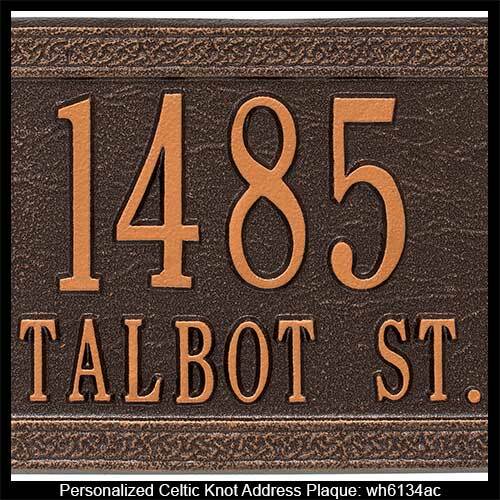 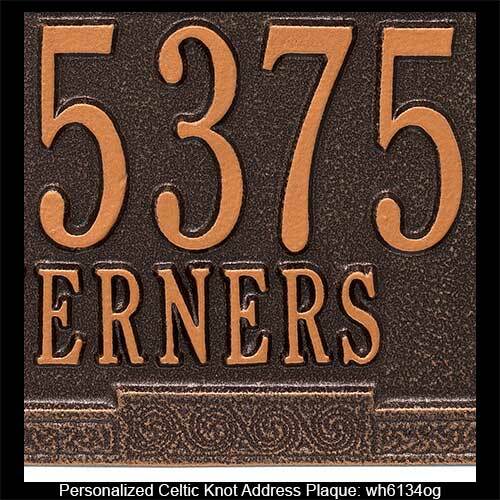 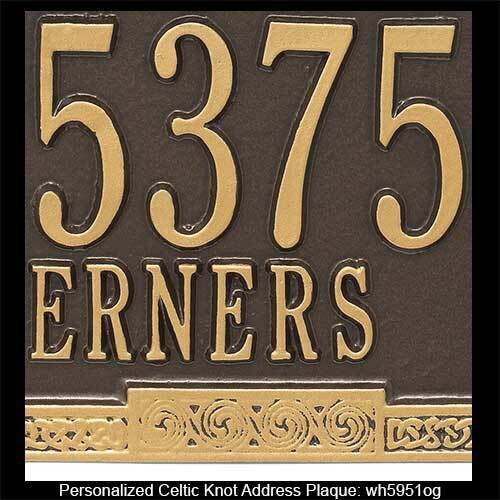 Personalized Celtic address plaque features a knot-work border and it is further enhanced with two lines of personalized street address or message inscribed with gold lettering against a contrasting bronze finish. 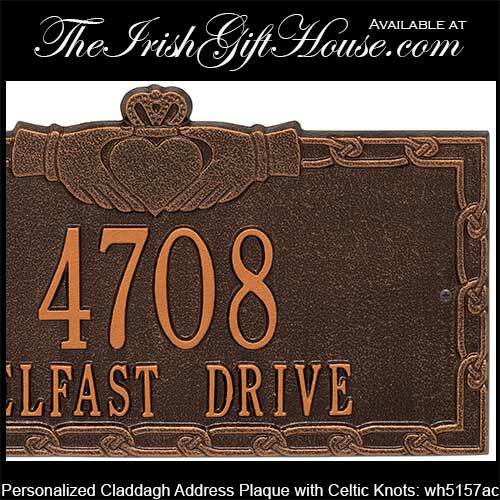 Personalized Irish gift is a Celtic address plaque that features two dragons with interlaced knot-work along with your street address or message inscribed on the antique copper finish. 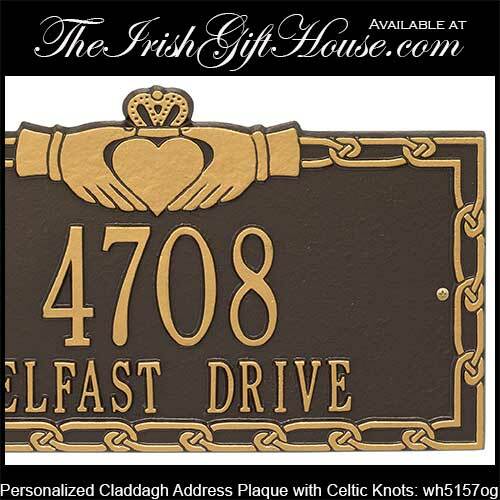 Personalized Irish gift is a Celtic address plaque that features two dragons with interlaced knot-work along with your street address or message inscribed with gold lettering against a contrasting black finish. 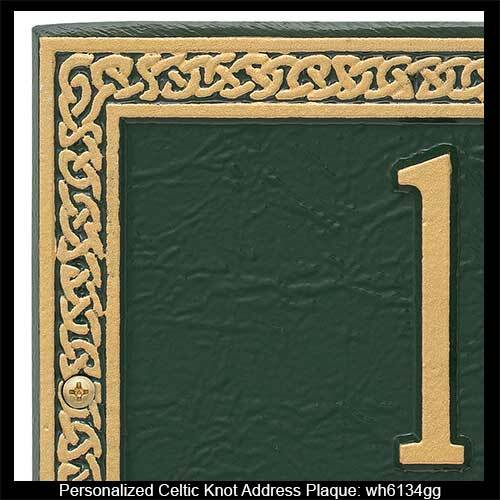 Celtic address plaque is a personalized Irish gift that features two dragons with interlaced knot-work along with your street address or message inscribed with gold lettering against a contrasting green finish. 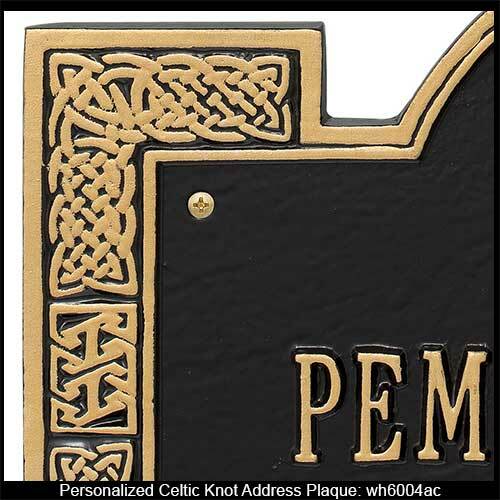 Celtic address plaque is a personalized Irish gift that features two dragons with interlaced knot-work along with your street address or message inscribed with gold lettering against a contrasting bronze finish. 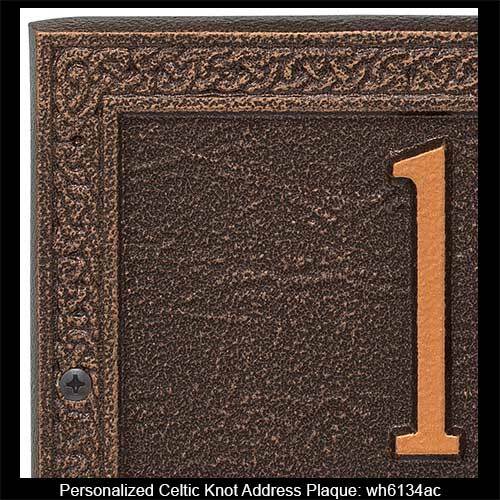 Celtic address plaque features the Irish word for welcome, Fáilte, along with knot-work and two lines of personalized address or message inscribed on the antique copper finish. 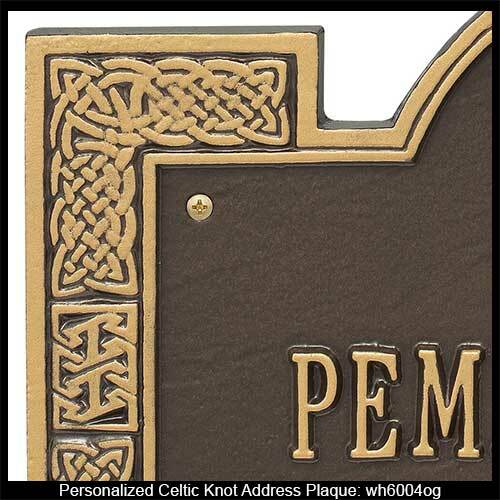 Celtic address plaque features the Irish word for welcome, Fáilte, along with knot-work and two lines of personalized address or message inscribed with gold lettering against a contrasting black finish. 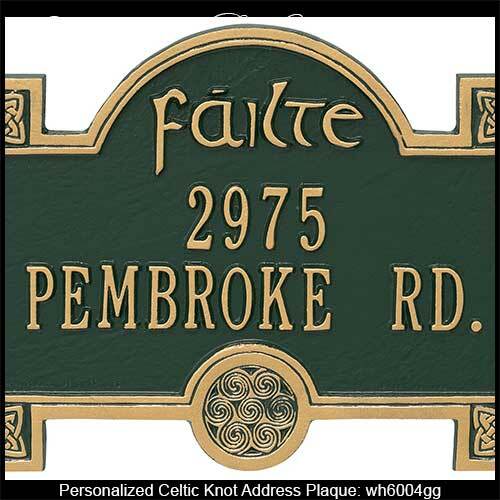 Celtic address plaque features the Irish word for welcome, Fáilte, along with knot-work and two lines of personalized address or message inscribed with gold lettering against a contrasting green finish. 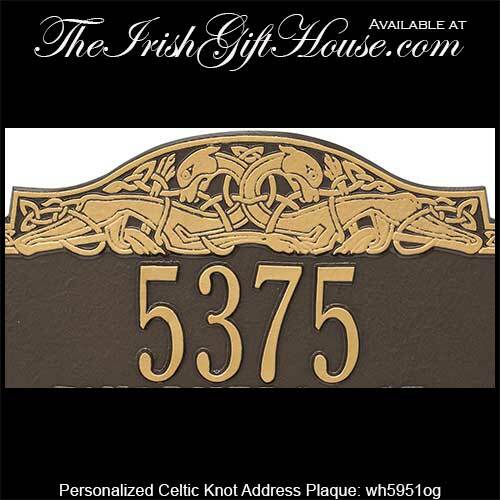 Celtic address plaque features the Irish word for welcome, Fáilte, along with knot-work and two lines of personalized address or message inscribed with gold lettering against a contrasting bronze finish. 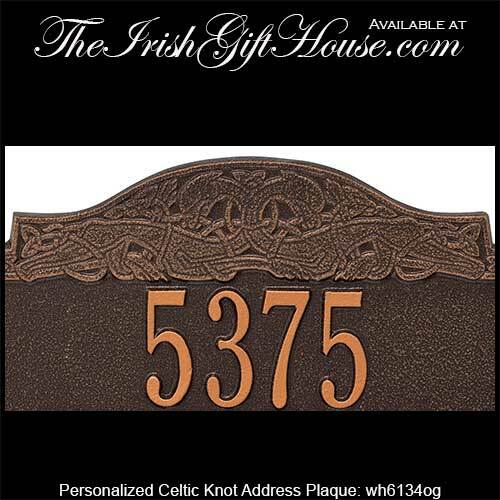 Shamrock address plaque features the Irish word for welcome, Fáilte, and it is enhanced with two lines of personalized address or message inscribed on the antique copper finish. 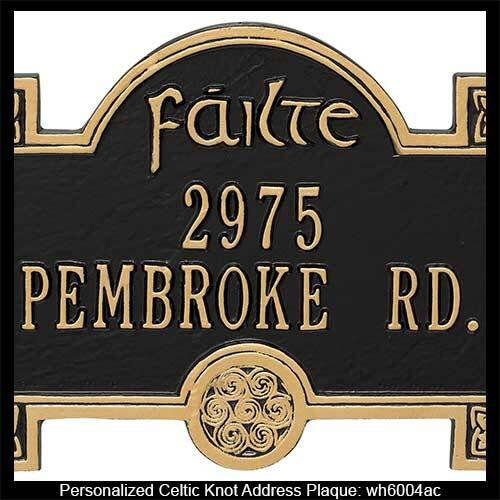 Shamrock address plaque features the Irish word for welcome, Fáilte, and it is enhanced with two lines of personalized address or message inscribed with gold lettering against a contrasting black finish. 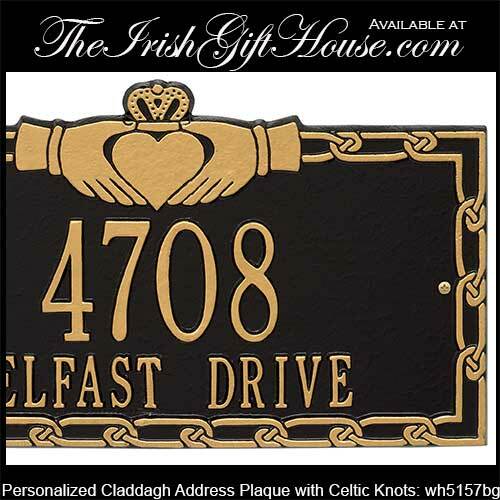 Please also take a look at the coat of arms sections for additional personalized items from The Irish Gift House. 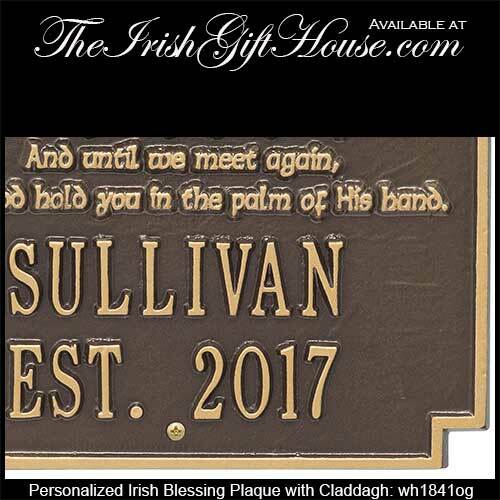 We have several fantastic sections with authentic designs that include the Irish coat of arms glassware along with the Irish coat of arms gifts. 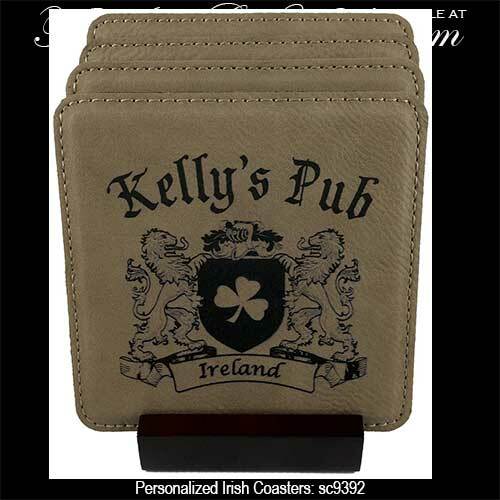 These assortments features several different size and style glasses along with everything from personalized bar sets to flasks. 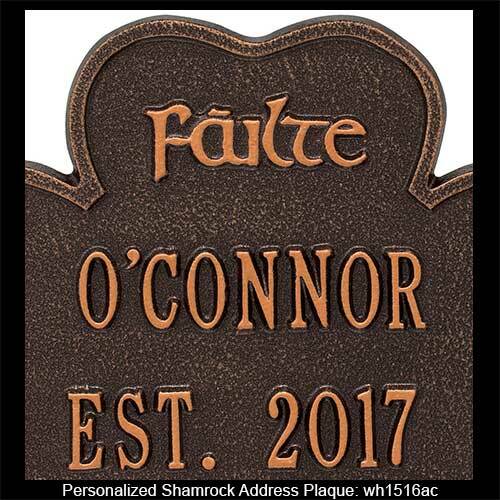 We also have additional outdoor decorations located in our Irish garden gifts category, and you may also wish to look at our selection of Irish flags that we stock in several sizes.